Mattis resigns. So should Trump. Let's forget about whether Trump is senile, clueless or a Manchurian candidate (and these are the only choices). The motive is no longer the point, but the effect for all those of us living at the edges of the US security arrangement. One can only imagine that Erdogan, Putin and Xi are gleeful at the sheer speed with which the US administration is becoming unable to function and ceding power. Were Greece to suffer an attack, one wonders whether the US now even has the decision-making power to come to its aid. This is a big additional step to being worried about the fall of democracy in the free world. One can only hope for impeachment, but this would be bloody and divisive, and the RP would not be healed by the departure of one man. For the foreseeable future, therefore, Europe is on its own. France, Britain and Greece, the only countries with serious defence capabilities, need now to start forming a European army with its own command and control structures. Greece has increased its taxes faster than any other developed economy over the past decade. In fact, only a minority of taxpayers carries the vast majority of the income tax burden. A new study found that 19 percent of workers pays 90 percent of income tax, and 4.5 percent of businesses pays 83 percent of corporate tax. This means one thing: the productive private sector is in its death throes. Most workers cannot earn enough to pay tax, and most businesses have very low turnover. It should tell the government that 2.2mn people still employed in the private sector can no longer support 700K public sector workers, a million unemployed and 3mn pensioners, plus children and other dependents. Greek governments have for years flogged a dying horse - no one more cruelly than Syriza. When I report on the travails of the Greeks, I see snide remarks about how they should stop whingeing and grow up etc. What people in better-governed societies may not realise is that a minority of Greeks is working very hard indeed to save the entire economy from collapse, but governments are not elected by them. They are elected by the handout majority. We have taxation without representation. Given demographic trends, other European societies could eventually end up with a similar democratic deficit. This article was published in The Spectator USA. Last year, President Recep Tayyip Erdogan campaigned for a new constitution that would change his country’s polity from a parliamentary to a presidential system. When German officials refused to allow his ministers to travel to Germany and woo its million-strong expatriate vote, he called them Nazis. He later also accused the German Chancellor of Nazism for saying that the European Union should reconsider its relations with Turkey – a veiled threat for suspending talks to bring it into the EU. Ankara and Amsterdam withdrew their ambassadors during a spat over the same campaign. 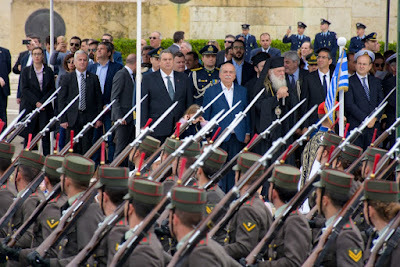 During a disastrous visit to Athens last December, Erdogan demanded the return of ten fugitive officers Erdogan considers plotted against him in a July 2016 army coup that nearly unseated him, even though Greece’s Supreme Court ruled against their extradition. And he called for a revision of the Lausanne Treaty, which has established peace between Greece and Turkey for the last century. But the worst clash was with the US. Last summer, Congress discussed imposing sanctions on Turkey over its refusal to release an American pastor. Now released, Andrew Brunson had been imprisoned for two years for allegedly plotting against Erdogan. The US is also withholding delivery of F-35 stealth aircraft Turkey has bought because it is unhappy over Turkey’s increasingly close relationship with Russia. Russia is building Turkey’s first nuclear reactor and Turkey plans to purchase Russian S-400 anti-aircraft missiles over the objections of NATO. A senior Greek official has described the way the government buys migration-related services as "chaos," after Greece's top court ordered an inquiry into the handling of European Union funds paid to Athens to assist with the refugee and migration crisis. Andreas Iliopoulos, head of Greece’s Reception and Identification Service, which registers undocumented migrants when they enter the country, says Greek and European taxpayers may be subject to fraud because many contracts are awarded directly to Greek firms and non-governmental organisations without going through a competitive bidding process. “[Fast-track procedures mean] I can go directly to interested parties. I can come to you and make a deal without revealing too much information to others,” said Lieutenant-General Andreas Iliopoulos in an exclusive interview with Al Jazeera. “That makes sense when people are landing on the beach and we have to feed them and there are no obvious means of doing so… This happened in 2015, but we can’t claim that in 2018. This article was published by The Weekly Standard. The Euro-Atlantic trajectory of the Western Balkans was cast into doubt after a referendum in the former Yugoslav Macedonia backfired over the weekend. Prime Minister Zoran Zaev gambled on the popularity of European Union and NATO entry – which enjoy support of 83 percent and 77 percent of the population respectively – to carry a proposal to change the country’s name to North Macedonia. Greece agreed last June to lift vetoes to the Balkan country joining both bodies if it adopts that name. While 91.4 percent of voters supported the change, only 36.9 percent of eligible voters turned out, making the referendum legally invalid. The hardline opposition’s call to boycott the vote is widely perceived as having won. On January 30, the deepwater drillship Saipem 12000 sent its drill bit into a cavern beneath one-and-a-quarter-miles of water and a mile of rock in the eastern Mediterranean. Italian oil and gas company ENI, which had contracted the ship, announced a week later that the cavern, called Calypso, was “an extended gas column”, estimated at 6-8 trillion cubic feet (tcf). The gas deposit belongs to Cyprus’ exclusive economic zone – an area of water where it has sovereign rights to exploit, manage and conserve natural resources - and seismic studies suggest that it represents only an intimation of the island’s future hydrocarbon wealth. Over the next three months, ExxonMobil and the Qatar Petroleum Company are to embark on their own exploratory drilling off Cyprus’ southern shore in October. “We know the size of the structures and the possible hydrocarbons in them,” says geologist Konstantinos Nikolaou of the intended drill sites in an allotment called Block 10. “The sum of the deposits may amount to more than Zohr… it is very promising,” he says. At 30 tcf, Zohr is the eastern Mediterranean’s largest known gas deposit, discovered three years ago offshore Egypt. Egypt plans to be energy self-sufficient by the end of 2018, doing away with oil and gas purchases worth $3bn a year. Similar deposits would make Cyprus not only self-sufficient, but an exporter. On Sunday, just under 1.8 million voters in former Yugoslav Macedonia will vote on whether to change their country’s name to Northern Macedonia. Polls will open at 7am and close at 7pm. The proposal stems from an agreement last June between the governments in Athens and Skopje, which aims to normalize relations between the two countries. They have been at odds since the fall of Yugoslavia, when its six republics declared independence. The southernmost has called itself the Republic of Macedonia. Greece objects on the grounds that this implies territorial claims on its northern region of Macedonia. In return for adding the qualifier “Northern” to its name, Greece will lift its standing veto on its neighbour’s membership in the European Union and NATO. 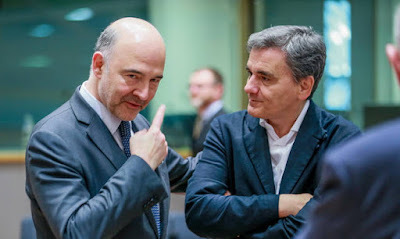 On June 22, at three o’clock in the morning, officials in Brussels declared a victory for the Eurozone’s last intensive care patient after eight years of public spending cuts, and cleared Greece to borrow from markets after August 20. Austerity has brought some important results. Greece balanced its budget, so it is living within its means. Its exports are rising, so it is bringing in much-needed foreign revenue. The assurance of creditworthiness from the International Monetary Fund and the European Stability Mechanism – the sovereign distress fund that now owns most of Greece’s debt - is an important signal to markets. It should mean that Greece can start to rebuild its credit history and refinance its debt. Other aspects of the deal are less reassuring. Supervision of public spending will persist for the next 40 years, so Greece hasn’t really graduated - it’s on probation. During those two generations, Greece must set aside an average of 2.2 percent of its economy to repay its creditors. This means that it will remain belaboured by austerity policies that presently include uncompetitively high taxes. Valletta, Malta - As Europe's leaders forged a new common policy on rescuing refugees at sea, one small ship came to embody the battle for the soul of the continent. The MV Lifeline soared to notoriety this week after it refused to hand over 233 refugees and migrants it rescued to Libyan authorities. The vessel, operated by German charity Mission Lifeline, picked the refugees up just outside Libya's 12-mile territorial waters on June 21. What followed pitted governments against freelance search-and-rescuers. VALLETTA, Malta - As it slowly steamed toward Boilers Wharf to be impounded by Maltese authorities, the MV Lifeline faced disgrace with a note of triumph – two long toots on its horn, signalling pride in its rescue of 233 refugees and migrants between Italy and Libya. Malta’s prime minister, Joseph Muscat, had earlier in the day said the Lifeline would be investigated for not being registered as a search and rescue ship but a pleasure boat, for disobeying Italian authorities co-ordinating rescue operations north of Libyan waters, and for sometimes switching off its transponder in an apparent attempt to conceal its whereabouts. Muscat’s intimation was that the Lifeline was abetting smugglers under the guise of conducting rescue, though he did not openly say this. Greece will officially graduate from eight years of financial dependence on its Eurozone partners in August, the currency bloc’s finance ministers announced late on Thursday, as they cleared the country to borrow from markets again. When he died almost a decade ago, Chatidje Molla Sali’s husband willed her a comfortable widowhood: at least a million dollars’ worth of rentable property in the northern Greek province of Thrace, where the couple lived, and in Istanbul, from where he hailed. That financially secure life has so far eluded her. Molla Sali’s two sisters-in-law contested the will on the grounds that, as a member of Thrace’s Muslim community, their brother was bound by the precepts of Islamic law, under which they, too, should receive a share of his estate. The Sali dispute has now escalated into a landmark case at the European Court of Human Rights and prompted the Greek government to radically alter the law governing its Muslims for the first time since they found themselves outside the jurisdiction of the Ottoman Empire in 1918. The Greek government faces a vote of no confidence over its deal with the former Yugoslav Macedonia. 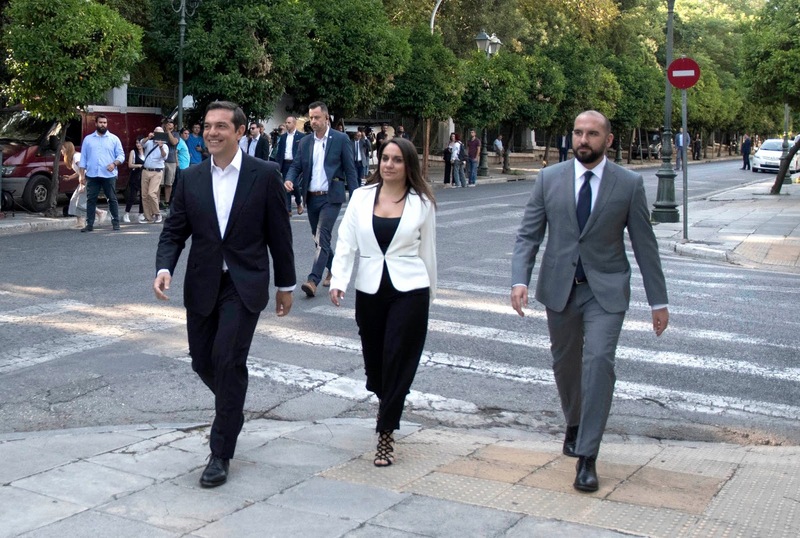 The conservative opposition New Democracy party brought the motion on Thursday, saying the deal “is opposed by the overwhelming majority of the Greek people.” The vote is to take place late on Saturday. To survive, the government needs at least 151 of its 154 MPs to vote against the censure motion in the 300-seat chamber. If it should fail to garner the votes, it would fall and an election would be called. All smiles: Greek premier Alexis Tsipras (L) informs president Prokopis Pavlopoulos of the deal on Tuesday. Greece and the Former Yugoslav Republic of Macedonia announced a historic agreement on that country’s future name, ending a 27-year dispute. Severna (or Nor180612 thern) Macedonia was one of three names left on the table since talks began in January. Premier Zoran Zaev chose it over Gorna (Upper) Macedonia and Nova (New) Macedonia. PELLA, Greece – Tens of thousands of Greeks took to the streets across the country on Wednesday, to protest against a reportedly imminent deal between Athens and its northern neighbour that would share Macedonian identity between the two peoples. Greece and the Former Yugoslav Republic of Macedonia have been in talks since January to establish full diplomatic relations for the first time since the breakup of Yugoslavia in 1991. Key to that normalization is finding a name for the country whose government resides in Skopje that Athens can live with. The European Commission opened trade proceedings against the US a day after it announced tariffs on steel and aluminium imports from its closest allies, Canada, Mexico and the European Union, but restrained its rhetoric. “This is bad news for European business, the transatlantic relationship and world trade,” said Marcus J Beyrer, Director General of BusinessEurope, an industry lobby group. “The EU needs to remain a strong leader against protectionism and unilateralism in support of rules-based trade,” he added. ATHENS, Greece -- Out of money and out of time, Alexandros Mnimatidis is a product of his generation. He cannot afford to attend the robotics degree he enrolled in because he also needs to work and contribute to his parents’ household budget. But without that degree, it’ll be difficult for him to rise above the retail work he now does for $4.78 an hour. 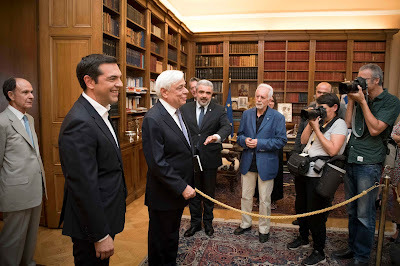 If he fails to obtain a university education, Mnimatidis may eventually join the ranks of Greece’s working poor – people who cannot improve their socio-economic position, no matter how hard they work. Greece vs. Turkey: Are we headed for an Intra-NATO War? 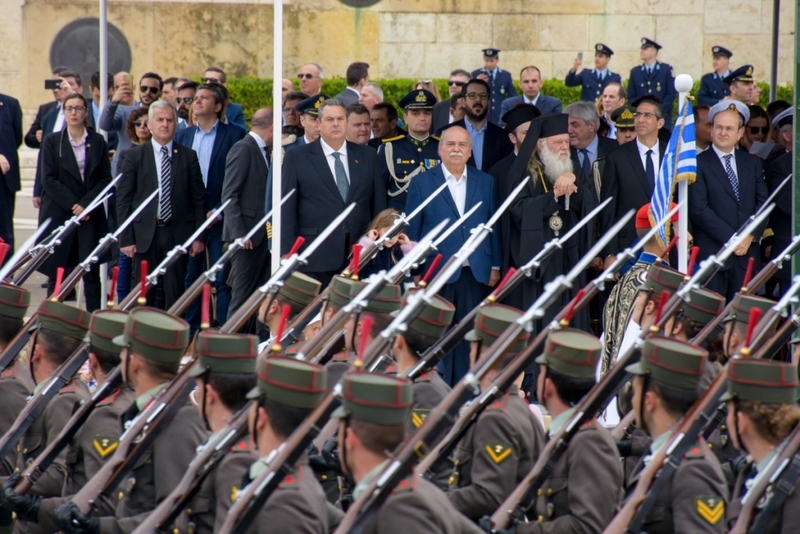 Soldiers parade on Greece's national day, March 25. The Aegean Sea between Greece and Turkey hosts one of the world’s highest concentrations of high-tech weaponry. Sixty-seven surface ships and two dozen submarines are deployed on a body of water the size of Lake Superior. The two air forces command 448 fighter jets armed with smart bombs and guided missiles. On land, 832 heavy tanks and more than 2,500 lighter artillery vehicles—as much tank firepower as in all the rest of Europe combined—could rapidly be brought to bear along a Greek-Turkish border only 105 miles long. These arsenals, built up over decades and constantly modernized, were not merely a boon to U.S. and German defence contractors. Western policymakers wanted to believe that loyalty to NATO’s mission of containing the USSR, rather than regional rivalries, motivated this exemplary level of Greek and Turkish defense spending. After the Soviet Union collapsed, good diplomacy and Turkey’s E.U. aspirations made it possible, most of the time, to overlook the downsides of an arms race between uneasy neighbors. Recently, however, the Aegean has become a dangerously narrow sea. For decades, Turkish military aircraft have regularly violated Greece’s 10-mile airspace around its islands, on the grounds that Greece’s territorial waters extend only six nautical miles from shore, and that air and sea borders should match. Turkish ships also ignore the territorial waters around a number of small islands whose Greek ownership Turkey questions. These ships and planes are intercepted by their Greek counterparts, and mock dogfights result. Occasionally fatal accidents occur. 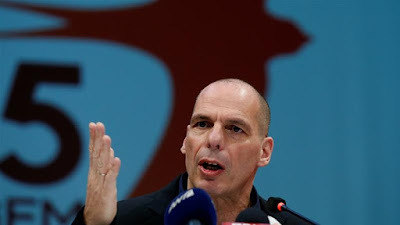 Athens - When Yanis Varoufakis launched the “Democracy in Europe Movement 2025”, or DiEM25, two years ago, he said Europe’s democratic deficit needed to be tackled as a continental problem. His six-month tenure as Greece’s finance minister the previous year convinced him that national government lacked either the guts or the clout to change Europe. “The sovereignty of national parliaments has been dissolved by the Eurozone and the Eurogroup,” he said at the time. He still draws energy and bile from those formative months in office, when Syriza went up against Greece’s creditors in the Eurozone and lost. Greece ended up signing onto a third bailout loan with further austerity measures. Has the Greek recovery really arrived? It's the moment we've been waiting for since bailouts began: The finance ministry says the Greek economy will turn a corner with 2.3pc growth this year, allowing it to make concessions to the beleaguered middle class after it graduates from the current adjustment programme in August. It points to a 19pc increase in exports in January and a small increase in bank lending for the first time in years. Bankruptcies fell last year for the first time since 2007. Interest on Greece's 10-year bond is 3.32pc, versus 6.79pc a year ago. Not everyone is convinced, however. Consumer confidence improved last year, but did not lead to higher consumption, and has worsened again this year. Many Greeks are worried that Syriza may overspend once Greece graduates from austerity policies. And they are aware that Greece was forecast to grow by 2.7pc last year, but grew 1.4pc. Europe must process refugees "more creatively"
The collision of Greek and Turkish coastguard vessels near the flashpoint islet of Imia in the east Aegean has raised tensions between the two countries to levels not seen in years. “At around 23:40 yesterday [Monday], in the waters east of Imia, within Greek territorial waters, a Turkish vessel performed dangerous manoeuvres in contravention of international rules for the avoidance of collisions and rammed into the portside stern of the Greek naval vessel 090,” read a statement from the Hellenic coastguard on Tuesday. The coastguard made no other official comment, but certain Greek media quoted government sources as saying that the Turkish vessel had attempted to ram the Greek vessel amidships. Though uninhabited, Imia has acquired symbolic importance for both countries after they nearly went to war over it in 1996. Monday night’s incident followed another offshore Cyprus on Sunday, when Turkish navy ships prevented a drilling rig from reaching its intended position. The rig, owned by Italian energy company ENI, was contracted by the Cypriot government to drill exploratory wells. Has Classical Antiquity Divided Europe?